There's nothing like students vs. teachers in an epic athletic battle! Come join us from 6:00 PM - 8:00 PM at the Chico High Big Gym for an amazing night of entertainment and spectacular athleticism. There will be food for purchase, raffles and many other festivities. 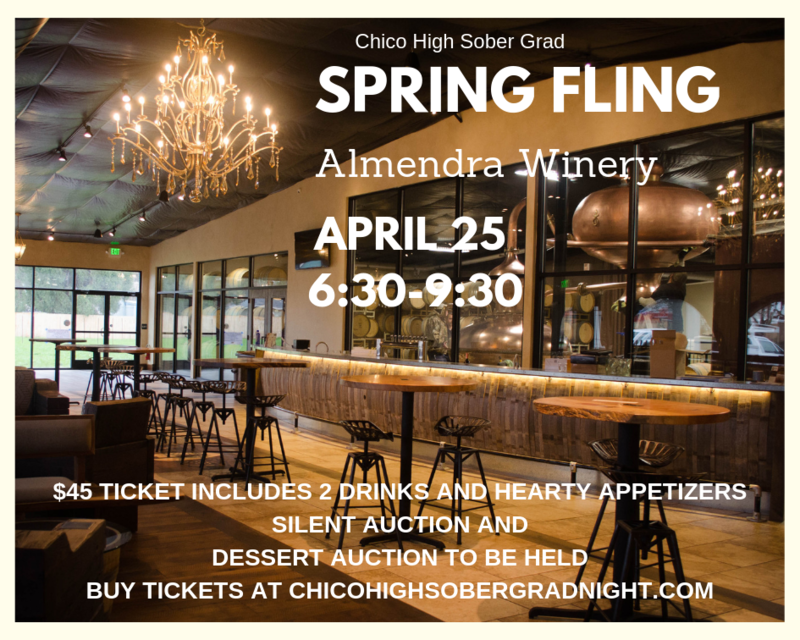 Come join us for a spring fling social event at Almendra Winery & Distillery located at 9275 Midway, Durham from 6:30-9:30 pm. Your ticket includes admission, hors d'oeuvres, dessert and 2 drink tickets. Specialty drinks are available for purchase. Tickets are $45.00 per person in advance and $50.00 per person at the event. A silent auction will also take place. Tickets can be purchased at by clicking here. If you have any questions about the event, contact Julie Loeb at 530-321-3578. All seniors are invited to make projects that will be auctioned off to raise funds for Sober Grad Night. Some students will make them in their welding, art, graphic arts, and ceramic classes. Some will build their projects from wood on the first day from 8:00 AM to 3:30 PM at the Senior Project Build Day. Students will be helped by a group of parents, CHS teachers, community volunteers from Chico Rotary, Odyssey Teams and others. We will spend an amazing day creating one of a kind projects to be auctioned off on Monday or Tuesday evening at the Senior Project Build Auction. Shout out to Madison Bear Garden who will be providing lunch for the students. This day is a long CHS tradition and it is one that you and your Panther will not want to miss. This largest fundraiser for Sober Grad Night. The Seniors design and build their own creations and they are not limited to birdhouses. There have been dog houses, tables, chairs, patio furniture, and bars. We look forward to seeing projects made of wood, ceramics, glass, metal, baked goods, jewelry, and wall art. Their creativity is awesome! The auction for these masterpieces will be on Monday, May 20 with Silent Auction starting at 5:30 PM and Live Auction at 7:00 pm in the Lincoln Center/Gym. Worried about not getting a good seat at graduation? Problem solved. We will also have a set of 6 front row seats at the graduation up for auction. These are worth gold on that night! Plan to enjoy dinner at the auction as there will be many food vendors. Then view, bid on and buy your favorite project. Bring your checkbook, cash or credit card and a competitive spirit! Please invite neighbors, business associates, close relatives and other folks who have a checkbook and a competitive spirit who want a unique, one of a kind, awesome work of art! This is a wonderful community event where families of all students, not just seniors, as well as the entire Chico Community come to celebrate, bid on and buy our talented senior students projects. Let's help our Seniors reach their goal! Floral leis are a graduation tradition which many Panthers partake in. The majority of parents purchase Lei's at Costco for $12.99. As a service to our senior parents, and to help support Sober Grad Night, we are offering Lei's for purchase which will be HAND DELIVERED to your student after graduation practice on the morning of graduation. This will save you from having to drive to Costco on graduation morning! We are pricing leis at $20.00 (including tax). Graduation day will be hectic for us all and you will definitely want to take advantage of this service! Click here to purchase your student's graduation lei. The Chico High Baccalaureate will be held at Bidwell Presbyterian Church, 208 W. 1st Street, Sunday, June 2 at 7:00 PM. This is a reflective, non-denominational service presented by seniors for their families and friends. Student presentations may include a speeches, poems, or musical presentations. Refreshments will be served. Students interested in auditioning can contact Nancy Bultema at (530) 520-6361 or email npbultema@gmail.com for more information. © 2019 Chico High Sober Grad Night | Powered by Netguava, Inc.